We are often asked about how organizations can optimize the value of their Learning & Development programs, with many C-level leaders looking for ways to increase training-related behavioral change as well as their return on investment. A recent VitalSmarts webinar addressed this subject quite nicely, and shared several perspectives that are well-aligned with ours. For as long as the recording might be available, you can listen to the webinar here. In case anyone needed convincing, some thought-provoking statistics were then shared. For example, only 7% of Learning & Development leaders measure the bottom-line effectiveness of their training programs. Possibly more troubling, only about 10% of all Learning & Development executives have met with the C-suite; and only a few align their training plans with the organization’s strategic plan. In addition, only 35% of the US workforce receives any training at all! And even then, the average is three days of training per year. L&D leaders must align with business outcomes, and move the “finish line” of their training to include an achievement phase. Rapid acceleration in the pace of change has taken place within the business world over the past ten years. This fact has also accelerated the need for organizational agility, in both thought and behavior. Agility and change are inextricably linked. 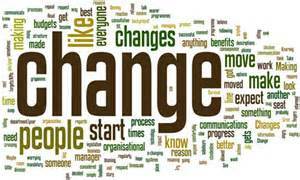 The goal in most change efforts is not only a change in attitude, but behavioral change. But of course change is not always perceived as being good. 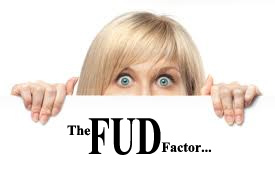 In fact, people at all levels tend to react with fear, uncertainty, and doubt (the “FUD” factor) when new ideas, processes, policies or procedures are introduced; and many cringe at the mere suggestion that there might be a different or better way to do their jobs ! Yet without change comes stagnation and potential loss. Getting people at all levels to change the way they think, talk, work, and act, and fostering a culture of open-mindedness and amnesty. Establishing new perspectives on work, work processes and value-added work. Effectively using various statistical tools to identify, analyze, understand and communicate variation. 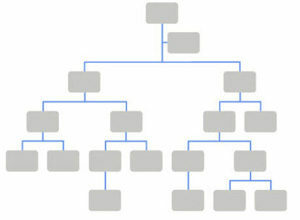 Enlisting input from of people operating the work processes. Quantifying how continuous improvement benefits all stakeholders. Improving leadership and coaching skills that lead to increased employee capability and engagement. What Does it Take to Implement Change? In a past post we shared some perspective about assessing workforce capability as well as leadership when planning a change or improvement initiative. Among other things, it was noted that without engaged, effective leadership it is difficult to implement the changes that are necessary for achieving a culture of continuous improvement. Effective leadership is about driving change. The ability to anticipate, lead and manage change is a critical indicator of organizational success. But, of course, change does not “just happen.” It takes place when leaders at all levels see opportunities and get others to share their passion about what can be accomplished. Strong leaders provide the initial and ongoing energy for change. Without strong leadership, most change efforts will fail. As noted in our previous post, implementation is the key step. Simply making speeches, declaring a new mission or vision and handing out short-term rewards alone will not cut it; management must advocate, lead and support change, and do so not only at the “launch” but throughout the implementation phase and beyond. It’s also important to remember that people will only follow leaders if they trust them, if they see the need for change, and if they are involved in creating the change. Change is brought about by a combination of strong leadership, human relations systems, beliefs, values and cultural practices. They are the true catalysts to sustained change and improvement. Argy goes on to note that measurement, questioning and reporting, tend to influence and change people’s behavior. In support of this perspective he cites some well-known research. Sentinel effect – The theory that productivity and outcomes can be improved through the process of observation and measurement. 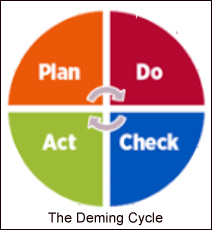 These views are well-aligned with Dr. Deming’s fundamentals, such as the Deming Cycle, on which much of our work is based. If an organization can develop a culture in which making improvements is the constant “way of doing business,” then they can achieve break-through gains on a recurring basis as opposed to the ad-hoc improvements associated with an on-again/off-again effort. Developing effective leaders within an organization is an important step toward achieving sustainability, workforce engagement, and a culture of continuous improvement. Many define leadership as getting people to want to do what needs to be done, and providing the energy and mindset for change and the commitment to sustain it. 360° feedback from peers, staff members and management is a popular and insightful component of the journey toward becoming an effective leader. With heightened awareness comes improvement. Coaching in a team environment. A project team or natural work group is the ideal place in which to exercise and improve leadership skills. Senior leaders must coach and mentor new leaders so they can build upon strengths and measure progress. While identifying the right things to work on is a critical decision we must make each day, it’s important to also have the right people working on the right things if we hope to truly achieve breakthrough solutions. 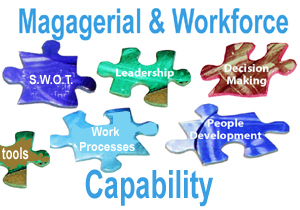 In other words, it is imperative to have a solid grasp of the team’s capabilities, strengths and developmental needs. We’ve discovered that workforce assessments need to be done in an organized, comprehensive way that includes a strategic mixture of observation, one-on-one and small group interviews to cover a diagonal cross-section of an organization. Key activities include an analysis of layout, work flow, bottlenecks and yield, and also an assessment of people’s understanding of tools as well as how their work impacts the total organization. It is also important to ask questions about the organization, how people feel they are treated and valued, and, in so doing, it’s important to assess their level of engagement. Based on discovering the best opportunities for improvement, an improvement plan can then be implemented, which will involve making key changes in processes and behaviors. Finally, it’s also necessary to review how people are being managed, as without engaged, effective leadership it is difficult to implement the changes that are necessary for achieving a culture of continuous improvement. Their findings are consistent with our observations and experience, which indicate barely 20% of reorganization efforts deliver the expected benefits. But it’s important to recognize that the concept itself may not be at fault, but rather the execution. In fact, too many implementations begin prematurely, thus sealing the fate of those involved. Start with a comprehensive design that includes the strategic engagement of leaders at all levels, and that takes into consideration the critical processes that create value for customers. Use flow charts or value-stream mapping to identify critical processes as well as those that are error-prone or that fail to add value so your plan can encompass the redesign of both the processes and the organization. Communication must be open and widespread throughout the process so that people at all levels are aware, on-board, and prepared for the upcoming changes. 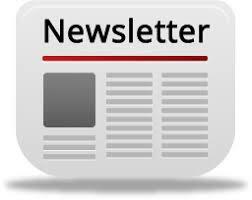 Be sure to include reasons for the reorganization and appropriate information about the implementation plan in this ongoing communication. Provide training for people in new or redesigned jobs. Provide coaching to help people at all levels make the transition. Follow-up, to ensure that any gaps in the implementation plan are closed. Continuing to analyze the concept that “knowledge” is one of the most powerful change agents, today’s focus is on what is arguably the most important source of that knowledge — your own value stream, which includes your organization’s work as well as the work of others. What is going on in technology? What methods are others trying out? How is it working for them? How could it work for you? often assume there must be a reason for it. And if they know of better ways of doing something, they often lack the influence to make any significant changes. Similarly, those with the broader perspective and the influence do not really understand how the work as it is done today well enough to arrive at the ‘Eureka!’ moment. One of the fundamentals of the Lean approach is that you must “go to the work.” Don’t just talk about the results or listen to people talk about the work — go to the work (a.k.a. 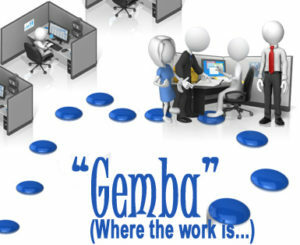 Gemba). Look at the work, and learn from the people who do it every day. Without this knowledge, little can be substantially improved, and effective “change” will be difficult or impossible to implement. As noted in our previous post, “knowledge” is one of the most powerful change agents, and all sorts of learning can become a catalyst for change. One very effective source of knowledge is our marketplace, which includes our customers and competitors. By learning from the market we can often see possibilities for innovation that have been overlooked. Of course learning is only the first step, as the gained knowledge must then be applied. For example, in the early 1980’s, Toyota believed that to grow their sales in the United States they would need to have manufacturing facilities here, but they concluded they did not have enough knowledge to do so successfully. So they entered into a joint venture with General Motors, opening the NUMMI plant in California to produce both the Chevy Nova and the Toyota Corolla in the United States. After they achieved their learning goals, Toyota went on to successfully open plants in a number of U.S. locations, applying their knowledge each time. While General Motors had the opportunity to learn the production systems that enabled Toyota to produce very high quality products at low cost, and while many individuals at GM learned a great deal through this venture, GM gained little more from the venture than the cars that came off the assembly line. Learning from the customer can also open our eyes to new possibilities. But it’s important to recognize that customers may tell you what they want, but not necessarily why. So making the extra effort to go beyond just “what they need” to gain knowledge is critically-important. Contextual inquiry is a method of learning more about the customer needs than the customer could tell you by watching the customer use the product in context. to suggest it, and you don’t know enough about their process to offer it! Similarly, knowledge of the competition can produce a greater sense of urgency or a heightened “willingness” to change, and in many cases can give us better insights as to the best ways to satisfy our customers and achieve a competitive edge. Much has been written about the importance of “change” within a business, and how developing an acceptance of it is a requirement to maintaining a culture of Continuous Improvement as well as a competitive position. However, it is also true that people tend to resist change, even when they acknowledge the need for it. While there are numerous methods for leading and managing change within an organization, “knowledge” is the most powerful of change agents. If leaders can make the practice of gathering and sharing knowledge more systematic, and initiate a systematic approach to pursuing knowledge not only about the outside world and marketplace, but also about the work itself, then they can more easily achieve breakthrough results as well as a more engaged and competitive culture. Of course this contrasts with the more common business culture of focusing on individual learning. But consider that a great deal of the learning goes to waste when in this model because much of what is learned stays in one place. An individual may accumulate a great deal of knowledge and skill in his or her work, but little is shared. One may master one’s own job, but know little about the work in supplier or customer organizations, which could help streamline the whole process. We’ll take a closer look at each of these sources of knowledge over the next few posts, and point-out how each can serve as a catalyst to change and Continuous Improvement.